Westport Sunrise meets at the Westport Inn and does a lot. Here's President Ron Holtz with the holiday basket of goodies being given away in the weekly raffle. Ron is an experienced President and the club is very supportive. And here's a view of the whole group, in the middle in the distance is President-Elect Eileen Flug who is taking care of some details on a project. The club did a survey of members to determine the status and areas for improvement. The survey is from RI and the club was very positive about most things. The club will now focus on areas for improvement and work on them. Clearly they are a vibrant club. (Mentioned by President Ron as a RI focus). Here's Michael and some of the attendees at RYLA. We asked some of the attendees to comment on their RYLA experience and here are their unedited comments. I had an amazing experience at RYLA and I learned a lot of things about myself and about being a leader. I learned that there are different types of leaders but all leaders share similar qualities such as passion, confidence, communication skills and determination. I was able to see myself as a leader and that I was valued and appreciated by others. All the participants and all the facilitators were very supportive and encouraging. Whenever I spoke about things I cared about, there were always people there listening who actually wanted to hear what I had to say. I plan to volunteer more at places like the Bridgeport Rescue Mission and Homes for the Brave where there are many people who need help and are just outside of my community. 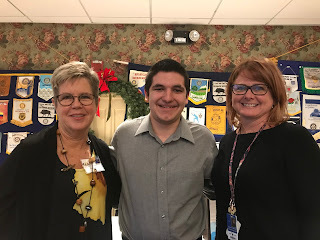 I also plan on getting my Interact Club to think about what we can do to make a positive impact on the Bridgeport community who do not have as many resources as we do, but are very close to our town. I had a positive experience at the RYLA conference and met a lot of new people, most of whom I am still in contact with. The activities that we did pushed me out of my comfort zone and encouraged me to think differently and see some different perspectives. I would like to become more involved with my school's Interact club and work on more projects. The RYLA event was amazing. What I learned from this event was one major thing for me, not speaking well in front of people, this had pushed my limits and made me speak. I had become so relaxed and knew many people, I was not afraid of speaking. One thing I learned was talk to someone, by that I mean just have a nice, simple conversation with the person, it could brighten up their day. Help others as much as you possibly can. Never judge anyone. My current plan is to get more involved in my Interact Club as much as I can to help others. Also I am really sorry this email is super late, Truly sorry. My experience at Fall 2017 RYLA definitely changed my life and helped me grow as a person. RYLA truly opened my eyes to the hardships suffered in our community, and allowed me to become understanding of everyone, regardless of background or situation. RYLA touched my life and the lives of others forever and I will never forget the experience. My experience at Fall 2017 RYLA was one I will never forget. First I learned of the qualities of a good leader and how to apply these skills to my community. As a result I am more confident, have a better understanding of others and of course more leadership skills. After RYLA I'm definitely a changed person and wouldn't give up this experience for anything. The Middletown Rotary Club meets for lunch at the First and Last Tavern. They had two students from RYLA and had a student of the month. In addition they had a speaker, a member of the club, who talked about the brain. 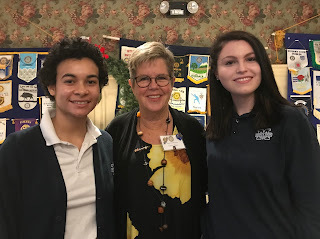 So here's the President of the club, Cheryl Duey with Maya and McKenzie who are members of the Notre Dame Interact Club. Maya is one of three student Directors at RYLA and McKenzie attended for the first time this Fall. 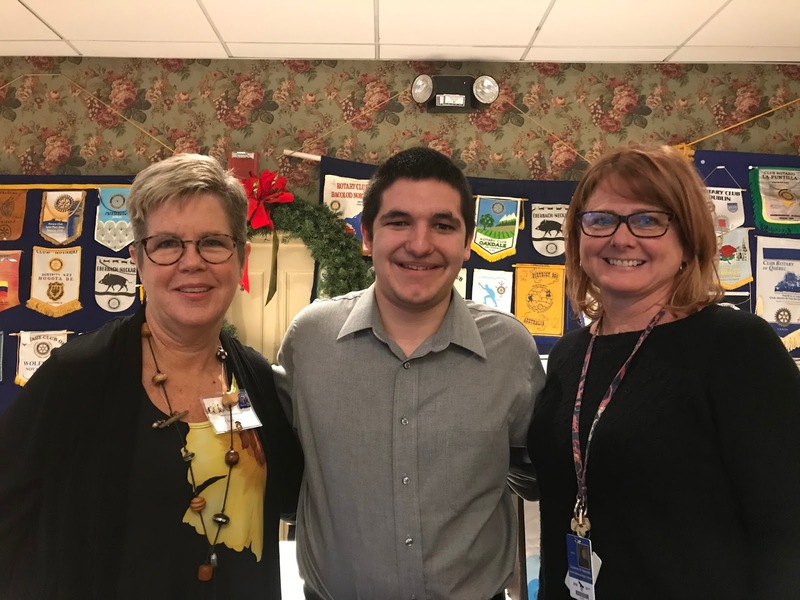 And here's the student of the month from Vinal Tech, Jacob Amendola with President Cheryl and his guidance counselor Sue Niman. Jacob want to start a family HVAC business with his brothers. Every year the East Hampton Rotary Club serves over 1000 people breakfast and Santa. The East Hampton Interact Club makes sure that every child gets a picture with Santa and they have a raffle to raise money for their projects. There is an amber alert picture taking. And the East Hampton Rotary Club members enjoy getting together, working and helping so many of the people of East Hampton. Also canned goods and non perishables are donated to the East Hampton and Marlborough food banks. This is Kevin Reich making sure that everything is ok at the East Hampton High School where the Breakfast with Santa is held. We take over the kitchen in the cafeteria. The East Hampton Interact Club also does face painting for those interested. Kevin Kuhr, Past President; Mark Cibula, President Elect and Kevin Reich, current President of East Hampton Rotary Club. The members are doing the work. And here's more members of the Interact Club working the picture making apparatus. At a meeting of the Norwich Rotary club on November 28 Dr. Jerry Lowney was given the Donald MacRae award. District 7980 is a part of Rotary Zone 32 which consists of many zones across northern US and Canada. The Don MacRae award is given each year to a Rotarian who has done something astounding Internationally. Dr. Jerry Lowney of the Norwich Rotary Club received this award for his work in creating and growing the Haitian Health Foundation which has transformed the health and educational infrastructure in a part of Haiti. Here is Dr. Lowney before receiving the award. Also at this meeting Governor Trish represented a proclamation which was made concerning the club. Here is the President Elect-James Daly receiving the proclamation and Gov. Trish reading it.